Experience the Flåm Railway – the amazing train journey from the high mountain station of Myrdal on the Bergen Line down to Flåm station, innermost in the Aurlandsfjord. The Flåm Railway is one of the world's steepest railway tracks on normal track. This 20-km line has a height difference of 866 metres, making an average gradient of 1 in 18. The horseshoe tunnel that spirals in and out of the mountain is a testimony of one of the most audacious and skilful feat of engineering in the history of Norwegian railways. A trip on the Flåm Railway is for everyone, whether on a family holiday or an activity holiday. 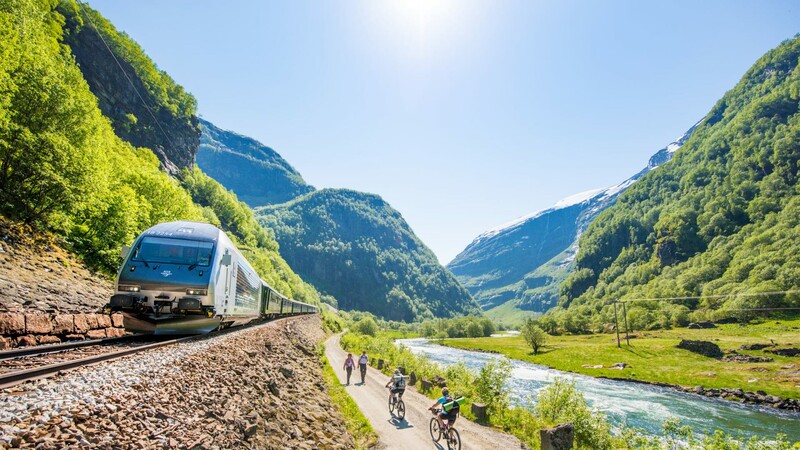 The Flåm Railway can be combined with a walk or a cycle trip along the Rallar Road – which promises unforgettable experiences for everyone!